The Maya civilization grew over 3,500 years to be the dominant agrarian society of a tropically forested Mesoamerica. The people farmed and traded within the region and developed a complex hieroglyphic script: the only one of its kind in the pre-Columbian Americas. It enabled a Maya mythic narrative to be captured, in its art and built environment, mathematics and cosmology. At the centre of the Maya creation myth stands Kakaw. The dissipating forces of world history that swept Maya civilization and its ruling elite, up and away from 1511, only strengthened the embedded cultural narrative that remained with the 90 % of indigenous Maya peoples: in their oral traditions, in their forest farming communities, where it lives today. Since 2005 Frida Larios (of Maya-pipil and Spanish heritage) has sought to bridge the rift, to re-codify part of the Maya mythic narrative as the New Maya Language, giving ancestral oral tradition new graphic form. One that borrows directly from the visual language of the Maya scribes of the ruling elite but speaks with and for the indigenous Maya of today. The now nearly 100 New Maya picto-glyphs that are the outcome of her process to date, have been regenerated into diverse media. Books. Installations. Garments. Jewellery. Toys. Most of them co-crafted in the Mesoamerican region. A new movement: the Indigenous Design Collective, was co-founded by Larios with Manuel “Che” Leon in Washington, D.C. The Indigenous design Collective re-imagines iconographies which weave in their masterful ancestors: spiritual, environmental and artistic footprint and cosmo-vision. Their first action, Designing from Maya Heritage, was presented at the Smithsonian Latino Center in 2015 for Smithsonian Institution cultural workers. The following year they co-created Maya Tree of Life community mural facilitated for children, youth and museum visitors at the Smithsonian National Museum of the American Indian. The artifacts of a culture are transient. A narrative once told lives forever. Frida Larios is from El Salvador (of Maya-pipil and Spanish heritage), a small and impoverished country in Central America with deep ethnic and social identity crisis. In 2004, these overwhelming historical tensions inspired her to found a cultural movement called New Maya Language, and while creating it, to find her own indigineity. Larios’s unique system re-codifies a small part of the Maya mythic narrative through new graphic form. Her methodology speaks with and for today’s indigenous communities by borrowing directly from the logo-graphic principles of ancestral Maya scribes. For nearly 15 years she has dialogued diverse Mesoamerican narratives around the world – for children, youth and designers, through exhibitions, workshops, installations, books, artworks, and textiles; including the commission of the Toronto 2015, Pan-American Games inaugural uniform and the Rio 2016, Olympic T-shirt line co-designs for the El Salvador olympic delegation. Larios is the Indigenous Advisory Chair for the International Indigenous Design Network (INDIGO) at the International Council of Design (Canada) and Deakin University (Australia). She co-founded Indigenous Design Collective (Washington, D.C.), an organization that partners with the Smithsonian Latino Center for Day of the Dead celebrations in the USA. 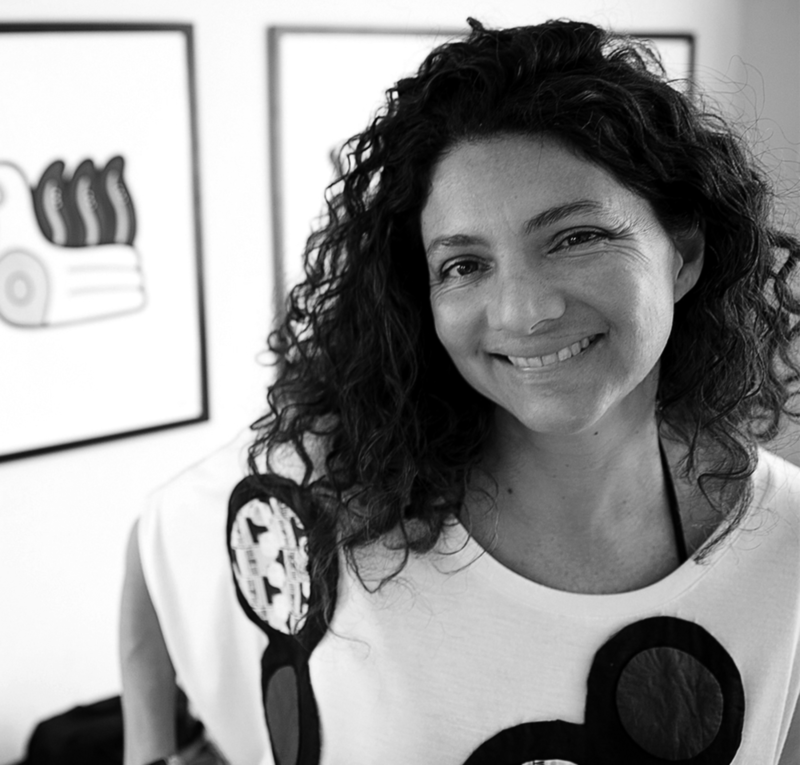 Larios is currently an Adjunct Professor in Art and Design at the University of the District of Columbia in Washington, D.C., where she lives. She holds a MA in Communication Design from Central Saint Martins College of Art & Design, University of the Arts London.